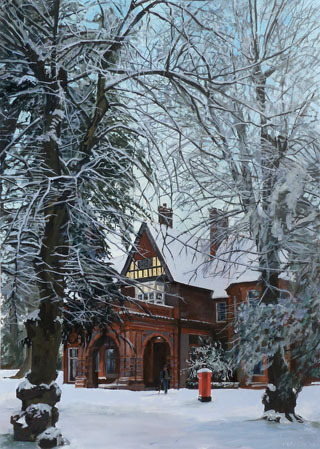 With Luton Art approaching, and the need for a Christmas Card, the idea of using Wardown Park Museum (the location of Luton Art) in winter as my next painting seemed like a good idea. I had not done a special painting for the Christmas card last year, but had re-used a small watercolour of a snowman. I have a stock of photos of the museum snowed under so narrowing down the selection was the first choice. My preferred image was very grey – it was that kind of day where the sky and everything is just grey – there may be more snow soon sort of feel. Another photo had sunshine and blue sky bringing out the colours. So I primarily used the first image but hinted at a bit more colour inspired by the second. The figure was cut out the second image too. My one concern was that he might be underdressed for the first image, but I think he is vague enough not to notice. The other alteration was a slight de-foliage. The building needed to be slightly more visible than in the source material. Now this is where the copious photos of the subject prove their worth. I used these to “re-build” the structure before covering with branches and leaves. Also visiting the site anew was handy to work out which foliage belonged to which tree, and understand what was present in the scene. I could also take further reference photos of brickwork to see detail that was lost in the photo. I like this view as it doesn’t say too much about the era of this scene. Though the metal gates around the portico are omitted, the relocated red pillar-box is present. Tree detailing work involved working on the canvas at 90 degrees and using cut out paper frames on a full size photo and the canvas itself. I made sure that these mini-areas worked as balanced compositions in themselves. Sometimes I’d re-draw these and so on more than one occasion, at the edge of these mini-frames a section of branch might not line up with it’s continuation. I quite like this as it suggests the trees are alive and besides its fun trying to find these occurrences. The frame took a while, getting various pine strips from B&Q and cutting to suit. I think this worth the trouble however as it finishes the piece off nicely.